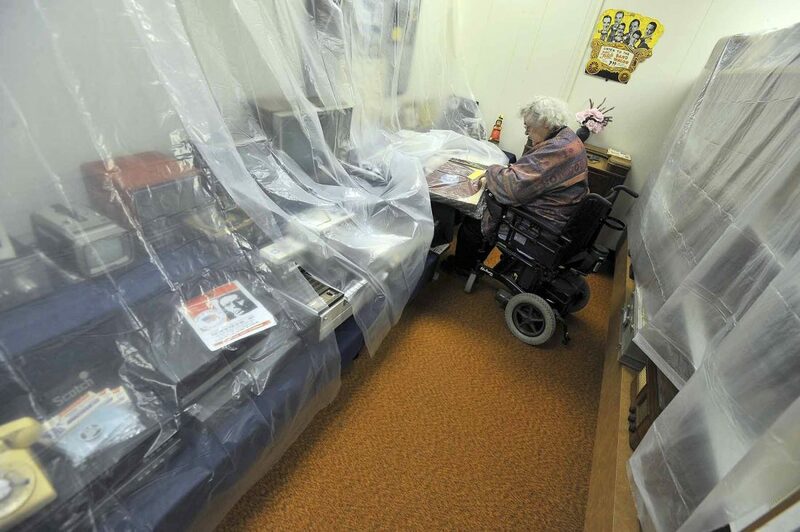 Phyllis Stewart, curator at the Webster County Museum, looks over a record played on-air among the artifacts under plastic sheets in the museum. A leaking roof prevents the museum from being open and they’re in search of a new building to house the collection. 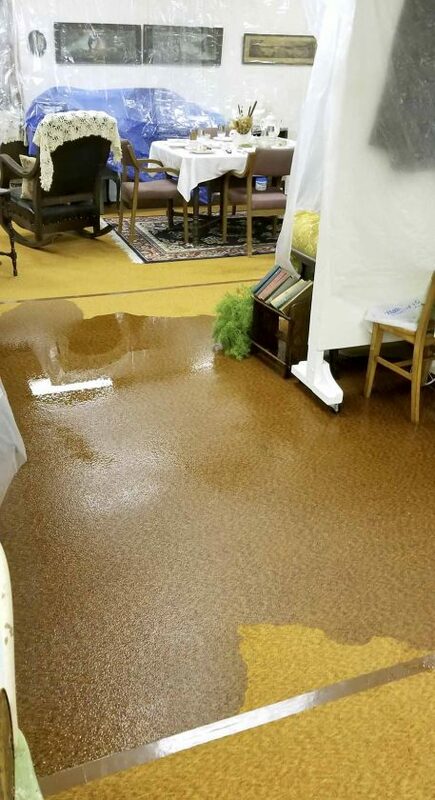 A leaky roof, combined with the spring snow melt and rains, left several areas of the Webster County Museum in Otho with standing water on the floor. 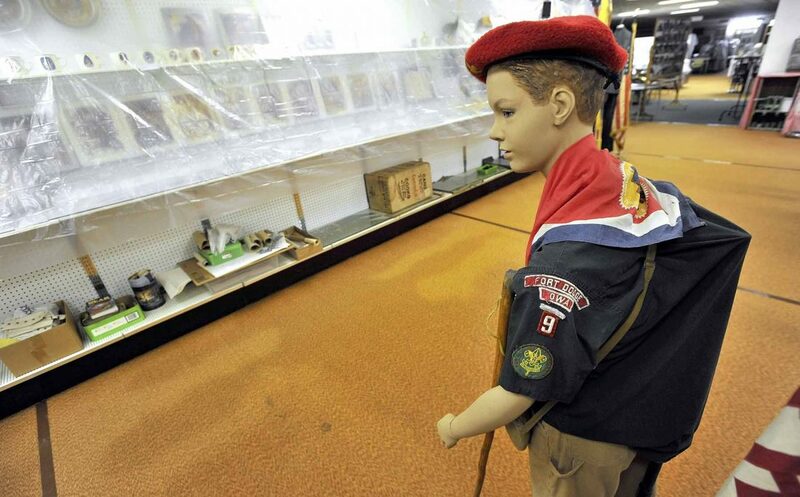 A mannequin wearing an old Boy Scout uniform stands among the plastic-covered displays and water-stained carpeting at the Webster County Museum in Otho. 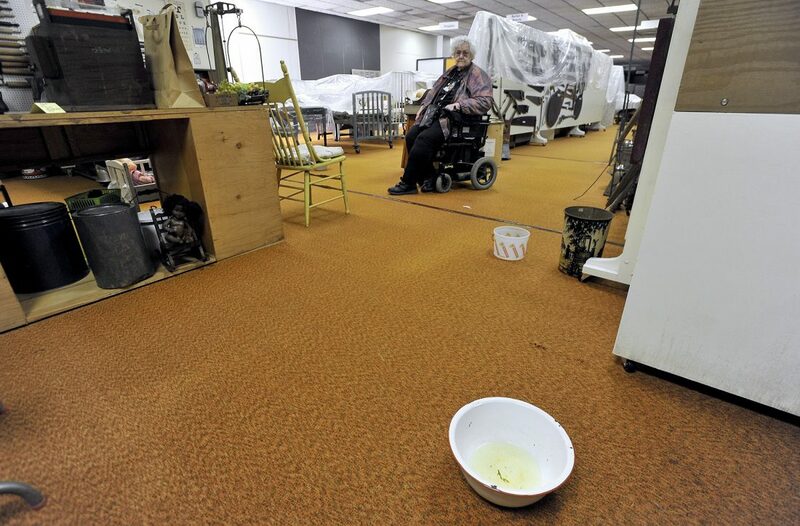 Phyllis Stewart, curator of the Webster County Museum, looks over an area that had standing water on the floor from the leaking roof. OTHO — The Webster County Museum, located in the former Otho Elementary School building, won’t be open for visitors anytime soon. The roof leaks badly and has been leaking for some time. Buckets full of dirty water that seeped through sit in the entry. The smell of mold from the carpeting permeates the air. 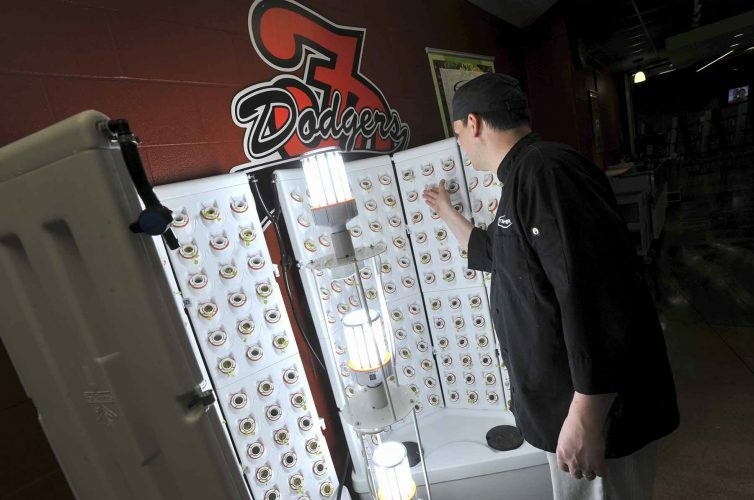 Much of their collection of artifacts is under plastic sheeting to protect it from damage. A few pieces that got wet during the last rain and snow thaw are set out to dry. It’s cold and damp. Only an inner office is heated in the winter. Phyllis Stewart, who serves as their unpaid volunteer curator, said it has reached a crisis. There’s no easy solution for the museum. To add to the problem, Stewart’s most active volunteer, Ruth Smid, 85, of Fort Dodge, was recently killed in a traffic accident. Stewart is hoping that disbanding isn’t the option that will have to be pursued. 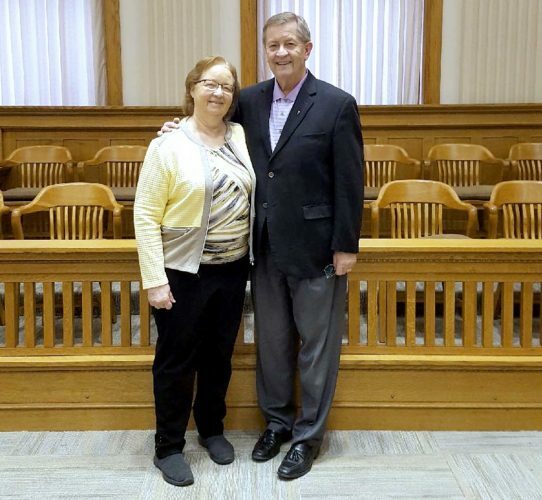 She’s looking for help, not only financial help and donations, but also expertise in museum management, infrastructure care and anyone with other skills that might be helpful, such as financial advisors. In the past, she said. the museum has attracted plenty of visitors. “We’ve had visitors from coast to coast, border to border and from other countries,” she said. The Webster County Museum has been located in several places, including two spots along Central Avenue in downtown Fort Dodge. 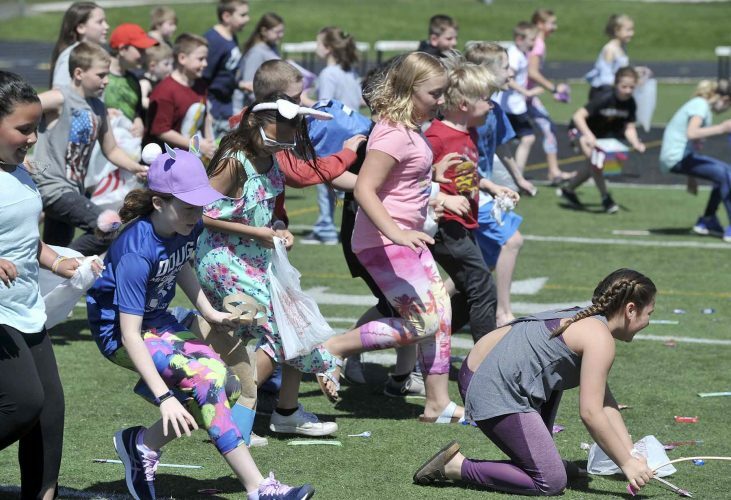 In August 2001, their collection was moved into the former Otho Elementary School. She is hoping that a building might be available to move the museum to. She said that she would like at least 11,000 square feet like the current building. While a smaller building might be offered, she’s hesitant to trim the collection to fit into a smaller space, she said. She hopes to be able to preserve and save all of it. Selling off parts of the collection is also an option that she’s extremely reluctant to choose. Some parts of it, such as the military collection, have become very dear to her. Closing the museum is her worst nightmare. She knows what’s at stake. If it happens, she can look back on her efforts with pride. “They can’t say I didn’t try,” she said. Stewart will be hosting a come-and-go event on April 18 from 11:30 a.m. to 7 p.m. at Fort Dodge VFW Post 1856, 518 S. 29th St., to meet with the public, seek volunteers and answer questions. Stewart said she will welcome feedback and ideas to save the collections. 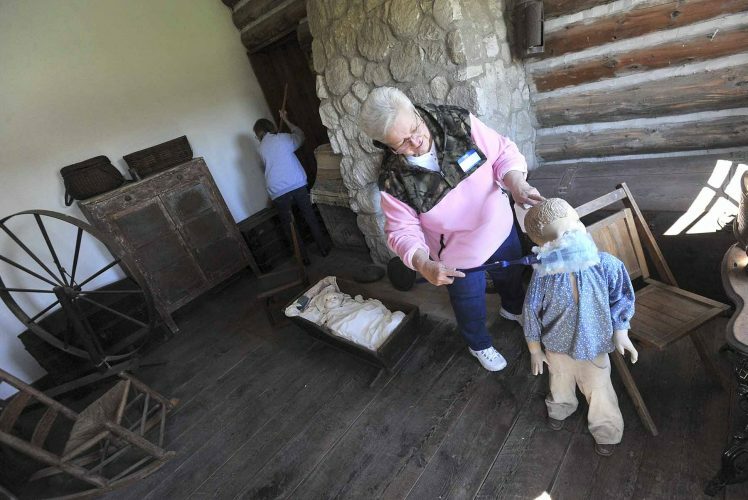 “We really don’t want to close the museum without some public input,” she said. 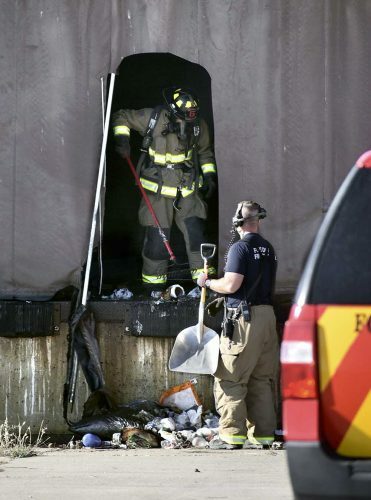 For anyone interested in helping, Stewart can be reached at (515) 972-4804. Where: Fort Dodge VFW Post 1856, 518 S. 29th St.